Amazingly, developers weren’t able to accomplish this. But now you can! The reason is that the original script design converted an entire event into a shop. 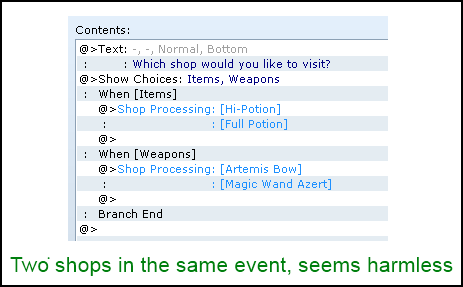 That is, when you access a shop from a specific event, all of the information about that shop is pulled from the event. Which, in hindsight, is a terrible idea. The only way to actually access two different shops from a single event was to make common event calls, but even that is just a workaround for a bad solution. 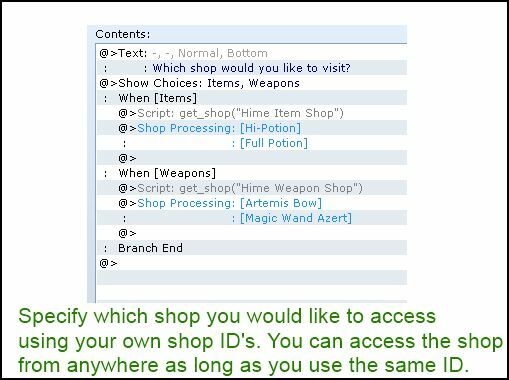 Now we have the idea of a “Shop ID”, which is basically any valid name that you could possibly give to a shop. My suggestion is to use names (“First Map Shop”), or perhaps symbols (:first_map_shop), or even numbers if you can manage that. Shop ID’s also allow you to access your shop from anywhere. Three events on completely different maps can all get the same shop (by the shop ID), and all of the shop properties such as shop stock or custom items added during the game will be loaded as you would expect. Check out the Shop Manager to completely change the way you manage shops in your game. Thank you so much for this. This helps a TON. It&apos;s great that you go all the way to make your scripts work as people would expect. I didn&apos;t find the workaround too odious (used Autoruns rather than Common Events), but being able to place them in a single event from now on will save lots of setup time and even a bit of the game&apos;s processing power.